Nolen Niu has announced the Divide Sofa. 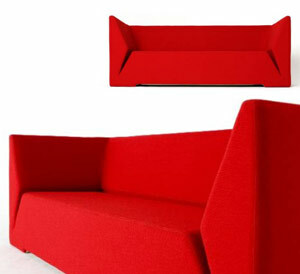 It uses high density foam and red upholstery. No cushions here. Ok. So it’s pretty sharp-looking. But this is a perfect example of form over function. From Niu’s website, “the exagerrated gap adds dramatic shadows for graphic effect”. It should be called the cookie crumb couch. The poor suckas buying this sofa will have fun cleaning the “exagerrated gaps”. LOL! The Cookie Crumb Sofa! I love it! btw: High density foam doesn’t last. Another “form over function” issue. You doust not eaten cookie on diese couch! NO COOKIE!